Get Quotes. Find The Best Prices. No Obligation. One of the first things that a homeowner will see and think about improving when driving up to their home is the siding on the exterior of the house. Whether the siding is vinyl, aluminum, stone veneer, cement board, brick veneer or wood, finding a good contractor to replace or repair it can be a challenge. We are here to help you find a good, reliable contractor and to discuss the many types of siding available today. If you invest in high quality materials, then you need to get these material install the right way. The increased value that a siding replacement gives to your home will be a benefit when the time comes to sell. You will have peace of mind if you hire a licensed contractor to do the siding installation and take care of all the details like permits, code conformity and inspections and make sure that the installers do an excellent job for you. A siding contractor can also provide you guidance in helping you choose the siding material that is right for you. 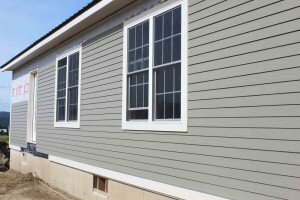 Our network of contractors have performed their services for many homeowners and as such have years of valuable experience in selecting materials and just as importantly deciding on the siding colors. It is so important to have confidence in the siding colors and material you have chosen prior to your contractor installing siding on your home. Very often a siding contractor will also be involved in replacement windows and can provide a comprehensive siding and window contracting quote for you. Seeing the complete picture is what an experienced siding contractor can do for you. Start today by speaking to a qualified siding contractor by filling out our simple Quote Request Form. Please take the time to review the material on our siding site in order to be as informed as you can when making the purchase decision that will improve the look of your home. Most homes today have made the switch to vinyl house siding. 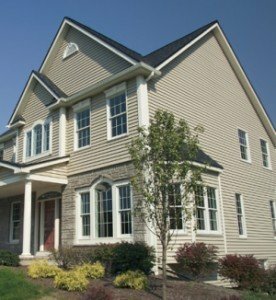 Vinyl Siding is a type of material that is created from a synthetic substance to be more durable than standard natural siding products. Vinyl house siding is also created to be weather resistant so it won’t be susceptible to mold or mildew like natural wood is. It also won’t warp or bend due to climate changes and is made to be color fast. The actual material used for today’s vinyl siding is a form of PVC. This substance is so durable it is now being widely used in the production of doors and window frames for the home as well. You don’t have to sacrifice good looks when choosing to use vinyl house siding. It may also be a great time to replace your gutters at the same time as replacing your siding. Vinyl siding is usually used in place of wood, aluminum or fiber cement siding. Many people use vinyl as their house siding because of its beauty, durability and it does not require constant maintenance. Whatever you want to do with your home whether it be remodeling or building an entire house, vinyl siding’s characteristics will surely complement your style. This will help make your home stylish and unique. Some advantages of vinyl siding include it is maintenance free and it never needs painting or sealing. It is resistant to termites and other wood boring insects. 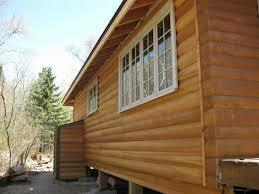 It also lasts longer than wood siding and it is available with insulated backing which helps in energy conservation. Aside from these, vinyl offers many styles, colors and patterns which allows homeowners to create a unique or classic design. It is also more affordable than brick, stucco, aluminum or wood sidings. Aside from making your home more appealing and maintenance free, vinyl siding is an affordable choice that offers style, ease of care and durability. It only needs few resources to make and maintain because it is recyclable, it is an environment friendly option for home siding. Aside from these benefits, vinyl siding is made up of a component that makes it resistant to extreme weather conditions and cold climate; it does not fade nor flake. Since it is made up of PVC resins, it keeps scratches and blemishes unnoticeable unlike wood or aluminum siding. To keep your vinyl siding in good shape, all you need to do is to wash it with a hose with a mild soap. The water will not damage the siding, it will not rust or rot like wood and metal sidings. Exterior Stucco Siding is made up of sand, lime, water and cement. It will provide a seamless and durable exterior surface on your home and is typically applied with 3 coats over a metal lath or directly to concrete block. Stucco has a big resistance to fire and last a long time. It also can be very low maintenance and can also be a good insulator of cold and warm air because of the material and the way it is installed. Maintaining a consistent temperature inside the home is easier having stucco on the exterior of your home. Stucco is favored in the southeast and south west of the USA because of its energy efficiency to extreme heat. Also, stucco looks very attractive from a building designer’s perspective. It has a smooth southwestern appearance in the southwest and a rough textured finished in the southeast as used in Florida. Stucco can be colored, artistic design can be scratched in the finished surface and mosaic tiles can be set into it before it dries. It has the ability to be transformed into of the most versatile and creative exterior surface materials on the market today. Homeowners could try to stucco a home themselves but will find that it is very labor intensive. Hiring a good, dependable contractor is a must when applying this type of siding. 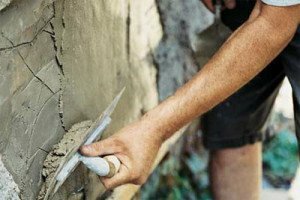 Hire an experienced Stucco contractor, check his references and make sure they are licensed and insured. A good stucco crew can install coats very quickly in a matters of days compared to a homeowner that does the work himself. Reach out to a local stucco contractor to get several quotes is Stucco is your choice for exterior siding. Fiber Cement Board or also known as “Hardie board” or “Hardie siding” is popular due to its durability and low maintenance features. It is a composite material that is made of cement, sand and cellulose fibers. It has many advantages over the other siding materials such as vinyl, aluminum, poly vinyl chlorides etc. Fiber cement siding is a material that is used to cover the exterior of both residential and commercial structures. Fiber cement siding is more durable than the other siding materials available in the market. You only need to install fiber cement cladding once and then enjoy the benefits for many years to come. It requires little maintenance due to its durable material. It has a powerful resistance to fire and that is why it is used in the high fire areas. It is also has a powerful resistance to fungus, mildew and termites and so there is no need for routine maintenance to prevent these problems. Fiber cement siding is available in many colors and stylish designs; you have the option to select the best design according to your style of home. It is available in wide variety of lengths such as horizontal, vertical and shingle style; these varieties can give your home a new and attractive look. It is more resistance to shrinking and swelling over time due to the change in the weather conditions or any rise and fall in temperature. It is considered to be the best siding material in extreme weather areas due to this feature. Fiber cement board is more versatile than the other siding material available in the market. Wood Siding Using wood as a siding material is a favorite siding choice in the USA and Canada. 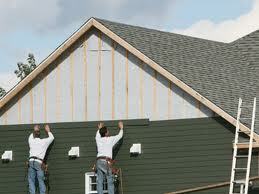 Siding can be vertical such board & batten or installed horizontal like clapboard or wood shakes & shingles. There a several wood species used and each have different grades that one can choose from. The selection and pricing vary greatly and is dependent on id the material is harvested locally or the material has to be imported to your area. Selections include pine, redwood, cedar, fir, spruce, barn wood or wood shingle. The price of wood siding can vary based on market rates. Locating some specific species or getting Western wood species on the east cost of the USA could be difficult based on demand and the local market. Also supply is a factor in pricing as some wood species are harvested faster than others. If supply is down then prices will rise for that particular species. Stop by your local home center and get the latest pricing in your area. Once the wood siding is installed, it needs to be protected for the elements by either painting, staining or sealed. This will protect it from insects, decay and the weather conditions. If installed and protected correctly, wood siding can last more that 30 years on a home. Maintaining your siding in good condition will make it last for many years. Proper maintenance means making sure it is painted or stained properly, power washing the siding to keep it free of dirt and mold. Before signing the dotted line on the contract, try to initially invest in the best species grade of wood siding that you can afford. Always ask questions before purchasing your material from your contractor. Ask about rot, splitting, cupping or checking of the material. Your wood siding always needs to acclimate to your specific weather conditions before installation. 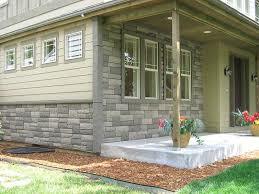 Stone veneer is used for decorating the interior and exterior side of the wall. It is a decorative building material which gives a natural stone look to the walls. Stone veneer can be made from natural as well as artificial stones. Stone veneer is prepared in a form that will make it look like real stone. Natural and artificial stone veneers are used along with other material to provide the required look on the walls. Good quality stone veneer is produced from locally quarried natural stone. They come in various colors which make it look like natural stones. Not all contractors provide stone veneer services hence a proper search should be made regarding the availability of the stones and the services of contractors. Brick veneer is a surfacing material. This type of structure is built around the exterior or interior face of a wall to create a beautiful traditional masonry appearance. Exterior veneer made of bricks is a free-standing structure that is supported by brick ties to the wall. As a free-standing structure, the veneer does not in any way support the structural framing of the building. However, it improves the building’s insulation, weatherproofing, and protects the inner wall from damage. Brick veneer is not as easy to construct as it looks. While there are many DIY guidelines that can aid homeowners in constructing veneer walls, they do not quite provide the assurance that experienced contractors can deliver. Veneer walls made of brick are usually susceptible to a number of structural problems that can become catastrophic and expensive to repair or replace. This is why when constructing a veneer wall, the builder must execute it accurately the first time to avoid further issues.